Ladies and gentlemen, tonight the Holbrooks had dinner at Nobu. A $270 dinner at Nobu. We had a toro tartar in a wasabi soup with caviar and an Asian peach on the side to "cleanse the palate." Yellowtail sashimi on mustard greens. Red snapper and sesame oil. Then lobster tempura in a cream sauce with shitake mushrooms. And black cod in sweet miso sauce with foie gras. (I had foie gras today!) And THEN the sushi platter, and THEN the chocolate souffle and the green tea ice cream. And THEN they had to roll me down the subway steps and onto the platform. $100 per person, plus tax, plus tip, plus the fun of Oh this is Tribeca! and seeing Robert DeNiro's apartment across the street! and “Is that an Olsen twin?” And I think it was. In two months we will move to Idaho, where the only raw fish to be found will be the raw fish we have catch in the river with our own bare hands and eat like bears, and we will remember when we are feeling sad, Hey, remember that one time when we went to Nobu? And we had all that great food? And we were in the cultural center of the Universe? And we lived there? And it was great? i didn't know you were living in the city? 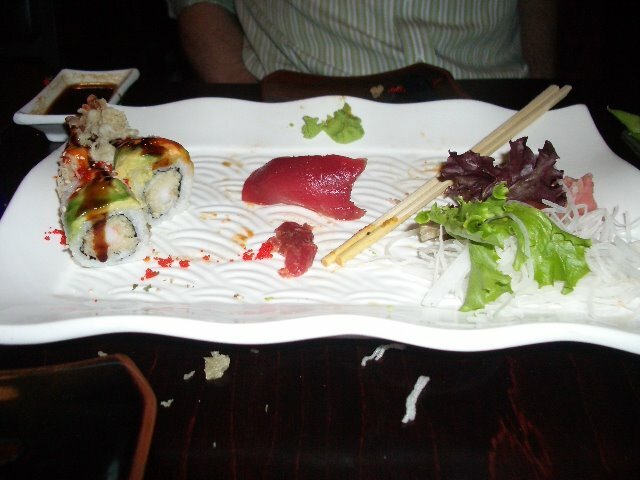 we would have joined you for sushi. it is our absolute FAVORITE. we are in Boise right now for a little vaca visiting the in-laws. we leave on saturday. next time you are in the city, let us know...we will meet you for some sushi.